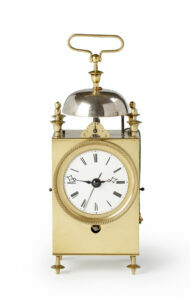 The spring-driven, day-going movement of this travelling clock is constructed between plates. It consists of going train and alarm. The going train has a verge escapement with a hairspring balance and regulation, situated on the backplate. 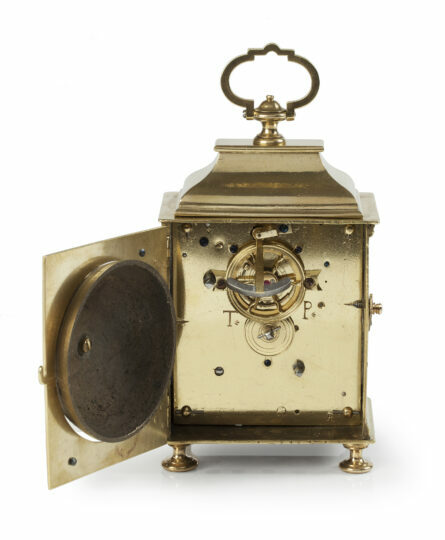 The alarm is wound by pulling a chord to the side of the clock and set by turning an Arabic alarm disc behind the hands, the tail of the hour hand indicating the alarm time. It strikes a bell, situated on the backdoor. The clock is wound from the rear side. 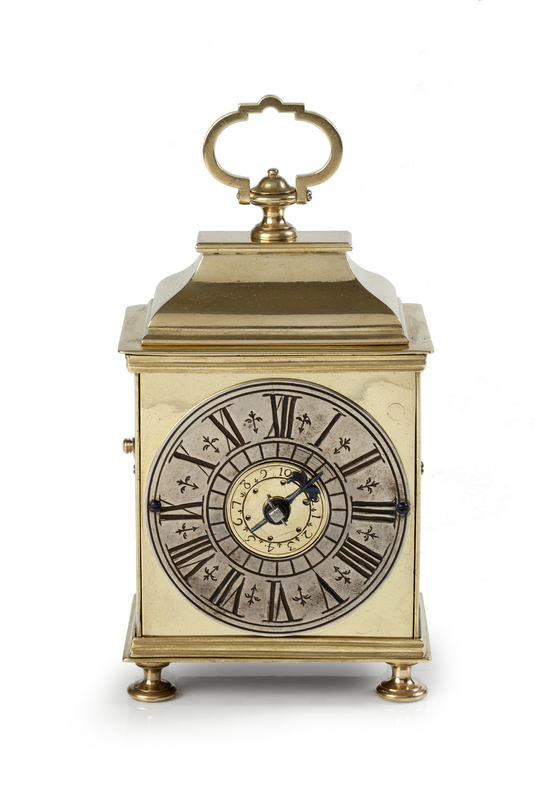 The silvered brass dial has a Roman chapter ring with half-hour and quarter-hour divisions. The time is indicated by a single blued-steel hand. 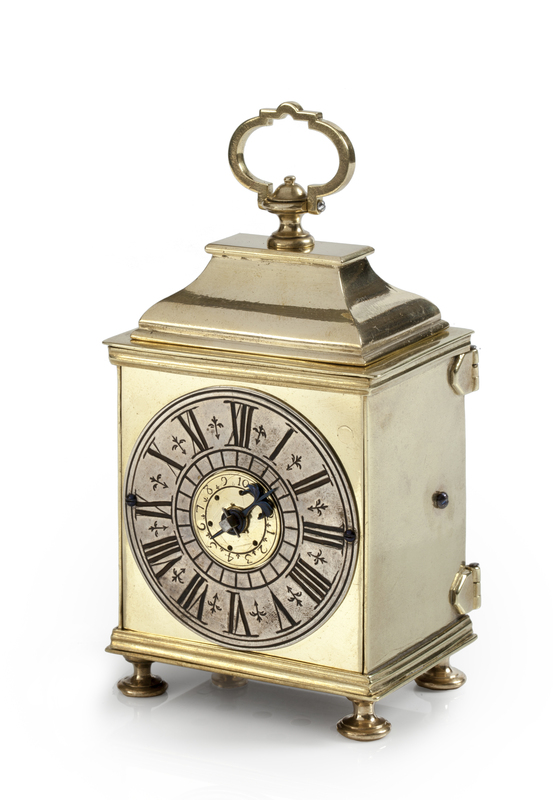 The rectangular brass case of the travelling clock has an inverted-bell top, surmounted by a brass carrying handle and rests on four shaped brass feet. 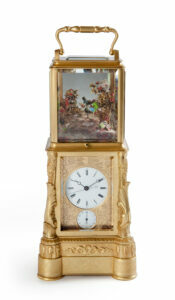 There is a door at the back giving access to the balance and regulation, as well as the winding arbor. 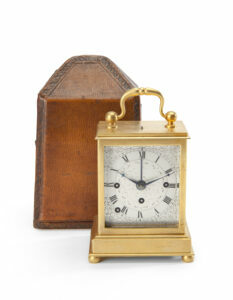 One side has an engraved monogram and the year 1760. No maker been identified related to this monogram.